We’re always working on something. And it’s usually a car…. Stromberg Pontiac – Official BIG 97 Demonstrator! The Stromberg Pontiac got a little update recently, in the form of some very cool period sign painting by our good friend Neil Melliard at ProSign. Neil is regarded as one of best guys around when it comes to this sort of work, and you can see why. This stuff is hand painted with good old One Shot enamel. We just told him what we had in mind and after a short discussion about styles and what was and wasn’t possible, we just left him to it. Two days later, we were done. And about a fortnight after that we got out the trusty red 3M Scotchbrite pad and mucked it all up! Instant patina. Pontiac fans will recognise the period advertising lines. The rest are all our own. 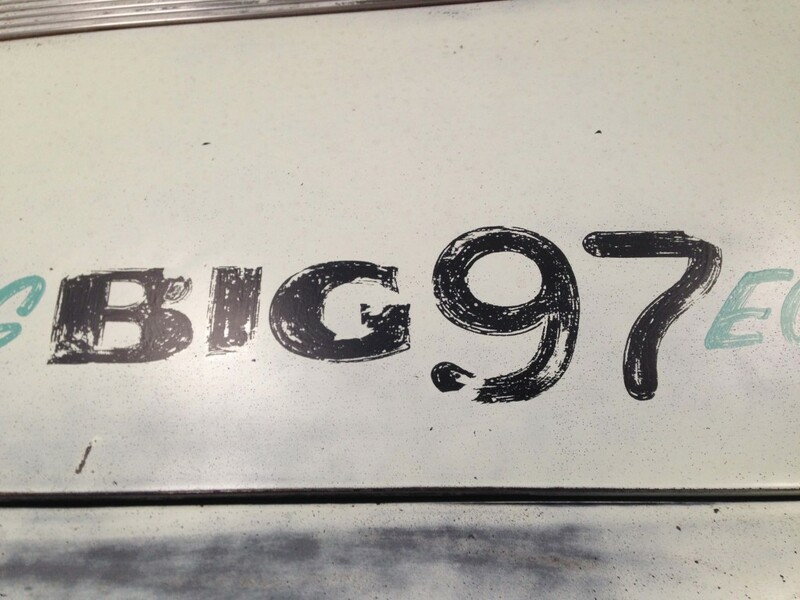 Look out for a lot more BIG 97 promotion in 2015. And more news on the Stromberg Pontiac. Great job Neil. Thanks! As usual, click on the pics for a closer look. The Stromberg project Pontiac moved a little further up the road this week when Rick, our fabricator made new floor pans. The ’55 Wagon had sat in an Oregon barn from 1976 until last year when we bought it, so I guess a little rust in the pans was to be expected. They weren’t rotten through rusty, but the little perforations were clearly only going to get worse and the water was soaking into the felt matting. The car came with a felt-backed red plastic flooring, but it had become so crispy, it snapped into pieces every time we stepped on it. 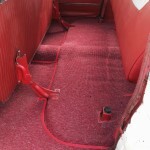 So we decided to take the seats out, remove the whole mat and replace it with some red square weave carpet, which kinda matches the pattern on the old plastic. We didn’t really want to swap the original mat out, but it was shedding plastic badly and by the time we’d pulled it out to swap the floorpans there would have been nothing left. 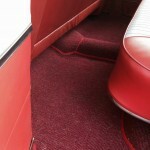 We’ll post again once the new carpets are in. 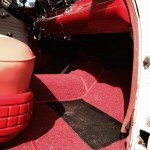 In the meantime, here are some pics of the floorpan installation. Rick cut the old sections out and made new pieces, including all the correct rolled strengtheners. Once we had treated all the surrounding metal and hit everything with the smart weld-thru primer, he welded them in, sealed everything up, painted the top and undersealed the bottom. He also replaced the wiring cover strips on the outside edges. In case you’re wondering, that sheet metal lump in the center is the underfloor heating outlet. Other recent tasks have included fixing the instrument lights as the rheostat in the switch packed in (we have jumped the power across the switch). We’ve bought a complete set of front end rebuild parts for when we fit the lowered spindles. New wiper blades. Oh and I’m driving the wheels off it. 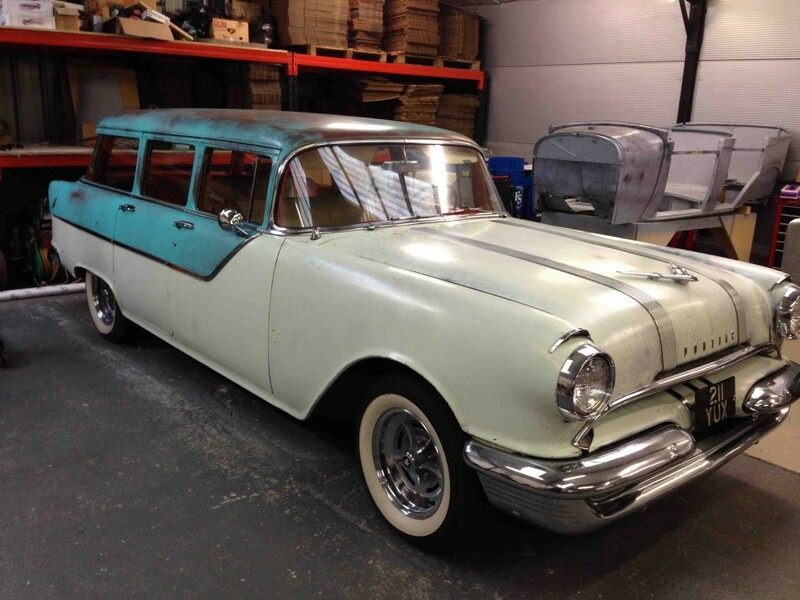 Kids’ bikes and dogs in the back, trips to the dump, you name it – everybody needs a Wagon!